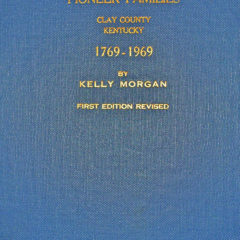 Throughout my time as a genealogical researcher and specifically Kentucky history and families, I have discovered no other book which draws as many inquires as Kelly Morgan’s Pioneer Families: Clay County Kentucky 1769-1969. His first edition was published in 1970 and I had the opportunity to purchase a signed copy of his book, which I still possess. Mr. Morgan was a resident of and teacher in Clay County for many decades. My mother had vivid memories of her days in the classroom as a young girl learning under Mr. Morgan’s tutelage. His personal history and occupation brought him in intimate contact with, I dare say, every families in Clay County, Kentucky. As I said, this book is the source of constant inquiry from genealogists, both part time and addicted. I have no idea how many copies were produced but it is long since out of print. Many libraries in Kentucky still have a copy but to attempt and buy a used copy is nothing short of highway robbery. With that, I would have to add that the content of the book does not warrant the cost. In its time, meaning the 1970s, Mr. Morgan’s book was a valuable asset to anyone doing research. Those days have long passed and genealogical investigators are inundated with all manner of readily available resources. Aside from the infinite mounds of internet sources every public and college library has extensive collections of genealogical and local history material. In 1970 no one could have imagined the wealth of available material and interest in genealogy that we have today. Why would anyone want or need to get their hands on a copy of Mr. Morgan’s Pioneer Families? The book is a piecemeal; sometimes family trees are out of order and certainly incorrect on many occasion. The researcher using his work has to be critically on-guard to avoid confusion of perpetuating incorrect connections. With that said every Clay County researcher should locate a copy and study the contents. Kelly Morgan personally knew the families of Clay County. His work is the culmination of many years of hearing folks talk about and share their family’s histories. While detailed information of the 1960-1970s generations may be cumbersome and faulty, the origins of the families are pretty accurate. The family groups themselves are right on and few people since Mr. Morgan have recorded the “pioneer” families which founded Clay County, Kentucky the way he did. Some critics of his work have marked it as a juvenile and perhaps pedestrian attempt at a “comprehensive” history of the county. They might say this because the pages are filled with nothing more than rudimentary matrixes of family pedigrees. However, in all places where Mr. Morgan did not have a name but knew a family member existed he left a convenient blank line. Mr. Morgan, being the teacher he was wanted us to consider his work, our work, to be completed as we the student discovered the answer on our own. Now days at two to four hundred dollars a copy who wants to write in them – well, I did and still would had I not out grown his work. The method used by Mr. Morgan to set down the family entries in his book is for the beginning researcher the easiest of the easy to follow. Because it is simply it connects the information in a way that is lost to modern internet sources. Where information sought is close to searching for a genealogical needle in a haystack. What Mr. Morgan left out of his book was a written history of Clay County, Kentucky. There are no anecdotes, mountain myths or family histories. Not in words anyway. The most interesting aspect of Mr. Morgan’s book is that it is filled with pictures of Clay County’s residents, including Civil War and other period photos. Mr. Morgan may have cut us short a few thousand words but he makes up for it with the frequent photos. Certainly for the beginning genealogists Pioneer Families of Clay County, Kentucky is an excellent starting point. 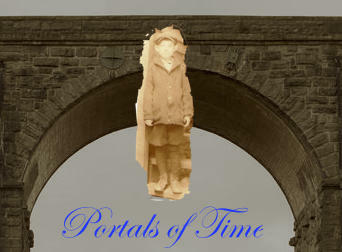 Many beginners will find the lost cornerstones of their family histories within its pages. I still find reason to refer back to it on occasion. It has been a valuable addition to my genealogical library and I wouldn’t part with my copy – don’t ask. After Mr. Morgan went to his reward, Mrs. Hazel Smith Morgan, who co-edited the first editions, seems to have produced another edition on her own. I have never seen a copy of it anywhere and cannot make a comment on its accuracy or correction of the first editions. Her edition is as scarce as Mr. Morgan’s. I have never regretted owning a copy of Pioneer Families. If you have a copy I would suggest that you keep it as a foundation for research but above all share it with those who are less fortunate. I would love to be able to find a copy as both my parents were born and raised in Clay County. Do you have any idea how I could aquire one? I am looking for information on family members who lived in Clay County Ky. My grandmothers maiden name was Maria (B) McCollum. If you have any information in the book on her family I would much appreciate it. I was told there is information in the book Pioneer Families of Clay County Ky. She married John Haywood Chapman. They had 4 children: Joyce Eileen, Constance Naomi, Bernice Edna and John Richard. Thank you for any help you can give.